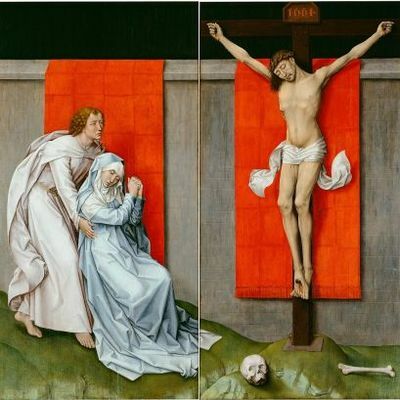 Van der Weyden - TripImprover - Get More out of Your Museum Visits! Who is Van der Weyden? Rogier van der Weyden, also known as Roger de la Pasture, was born in 1399/1400 in Tournai, Belgium. When he was about 36 years old, he moved to Brussels, where he probably lived until he died in 1460. Many of his surviving works are altarpieces, triptychs, diptychs, or portraits. He was a popular painter during his lifetime and received many international commissions for his work, which was rare for that time. Together with Robert Campin and Jan van Eyck, he is considered to be the most influential 15th-century painter from the Northern part of Europe. Van der Weyden was an innovative painter. He was one of the first to include commissioners of his work as participants in the religious scenes that he painted. He also stood out from other painters by including the emotions of his subjects into the painting. Works of Van der Weyden?